The reader immediately sees the candidate’s personal details and place of residence, allowing them to understand their personal profile with one glance. CV template to download "Different"
The Different resume will perfectly showcase all your qualifications in a clear and comprehensive structure. 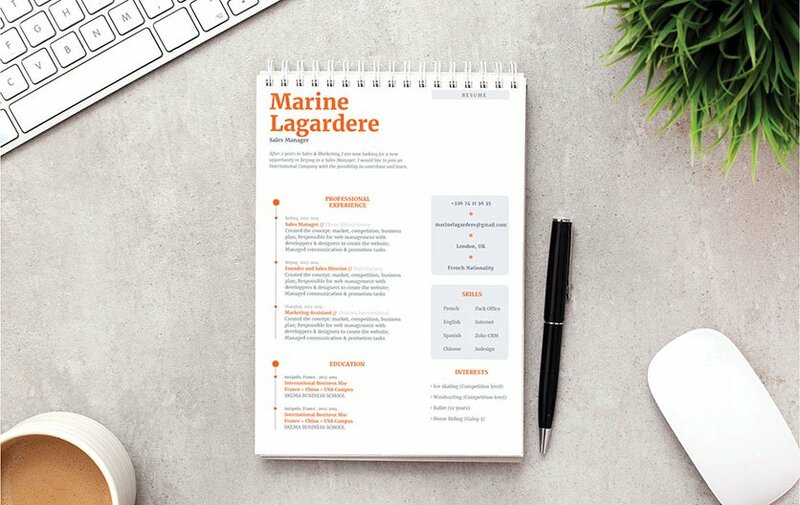 This professional resume template features a creative design that can excellently showcase all the essential parts of your resume such as your work experience and educational background. So whatever job you're applying to—this resume template can surely help you land that position! How can you grab the attention of your potential employer? It's easy—all you need is a comprehensive and effective resume. Your resume might just be your ticket to that dream job! A major factor in writing a resume is how clean and concise its lay out or over-all format is made. Usually, a resume is scanned for about 10-30 seconds—it doesn't get a full reading the first time ! So it's important that all the information written in your cover letter is easy-to-read and well-organized. To achieve this, use simple yet professional-looking fonts such as Seriff or Sans Seriff and apply bold and/or italic font styles to help guide your potential employer's eyes to the key parts of your resume. Use bullets or shapes to give more emphasis on important sections of your cover letter. Lastly, make your resume more readable by following a logical format with the use of headings and subheadings.